Classes are multi-level. Beginners are welcome. No knowledge of yoga is necessary although a basic level of fitness is advised. If you do have injuries or medical conditions, please consult your doctor first. Please also let Lucy know in advance (all information will be held in confidence) to make her aware of any conditions that may need consideration. Lucy teaches in such a way as to make yoga accessible to beginners and offers options when it comes to more challenging poses. In this way, people newer to yoga stay safe while more experienced practitioners are appropriately challenged. Please try and arrive a few minutes early so you are relaxed and ready to go at the start of class. Classes consist of a balanced sequence of yoga postures (āsana), with clear alignment instruction. Each class builds on fundamental postures, gradually increasing the challenge, then ending with more restorative poses and relaxation. Breath awareness is an intrinsic part of every class. Lucy is known for peppering more difficult moments with stories from the myths and philosophies that are part of the yoga tradition. She encourages physical precision and rigour but lightness and joy in the effort. By the end of a class, students should feel physically and mentally stretched, the reward for which is a deep sense of rest. 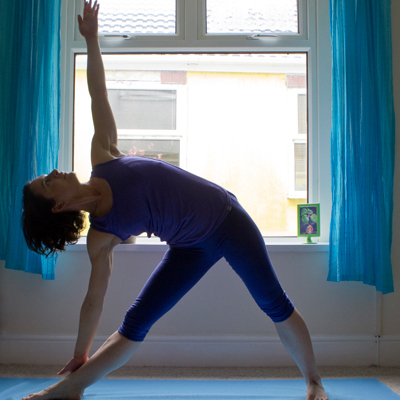 Lucy aims to nurture students’ confidence and skills to practice some yoga safely and effectively alone, so it can become a rewarding and enjoyable part of daily life.